A simple concept turned vision. 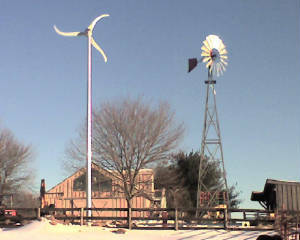 In this case, an old water pumping windmill has now been repurposed and recycled into a renewable energy resource. Carlos Fernandez-Bueno started on a journey to repurpose a windmill on his property in Dickerson, Maryland to produce electricity. He started out by dissecting the old windmill and tinkering with it like he did his Erector sets as a young boy. 50+ years later, with a little production help and many hours of studious trial and error, he had his first conversion prototype. Between 2008 and 2009, he patented multiple assembly prototypes and the rest, as they say, is history. Potomac Wind Energy is family owned and operated. We specialize in wind energy products and solar systems for residential, farm and business use. We test all the products we sell. There are 10 wind turbines and 3 solar systems to view at PWE. You can view all of these "in action" at our headquarters location. Potomac Wind Energy prides itself on providing customers with personal service at the lowest price. We will beat any competitor’s written price quote. We believe every one of us can produce our own clean, renewable power. Reduce your carbon footprint, your electric bill and save the planet one backyard at time! A family-owned business that strongly believes in wind as a viable and affordable energy source for homes, farms, and businesses. Assist customers to improve the environment; "One Backyard at a Time!" If you'd like to do a link exchange, please email your URL to info@potomacwindenergy.com. We'll feature your site in our site listing to provide more services to our customers. SWAN POINT, Md.- The first residential wind turbine in Southern Maryland will rise where the Potomac River meets Cuckold Creek near Swan Point in Charles County about 60 miles southeast of the nation's capital. "Power outages won't stop this farm; It's wind-powered"
Farmer touts wind power in county"
SEE SKYSTREAM 3.7 IN ACTION! AT THE U.S. BOTANICAL GARDEN!! Installed by PWE 05/16/2008, see how beautifully this Skystream blends into the majestic Washington, D.C. landscape. See it in action, see the possibilities! Visit the U.S. Botanical Garden's Sustainability Living Exhibits!